Did DIRECTV NOW Just Lose the Best Live TV Streaming Title? It’s been a rough week for DIRECTV NOW subscribers. The AT&T-owned streaming service raised its prices (again), dropped its available packages from four to two, and lost nearly half of its most popular channels in the process. 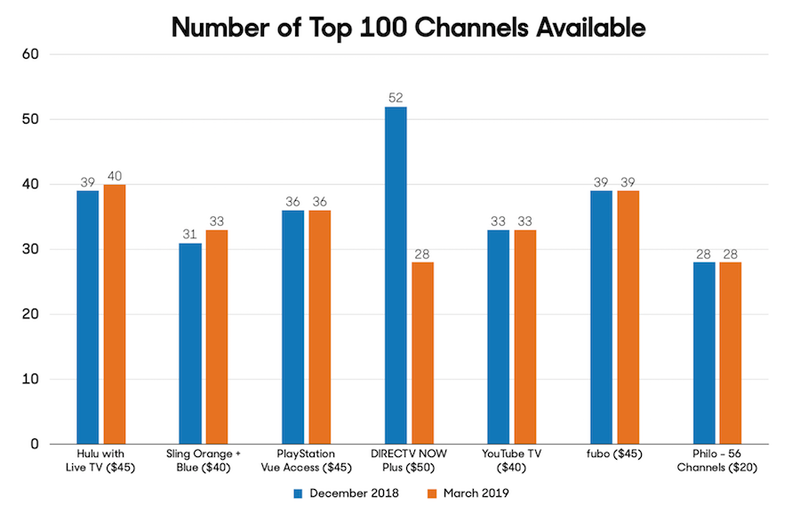 Since we started reviewing live TV streaming services in 2017, DIRECTV NOW has always ranked first in our evaluation of the services’ channel selection, providing by far the most complete replacement for cable TV. But after this disastrous week, it dropped to dead last. And it wasn’t a tough call. There’s no nice way to put this: DIRECTV NOW was absolutely decimated, and its email explanation to subscribers saying they’d be paying $10 more a month because “programming costs continue to rise” probably fell on a lot of deaf ears. We reached out to DIRECTV for comment but did not immediately hear back. While existing customers won’t see their channels change, I’m not confident that’ll be the case for long. DIRECTV NOW pulled channels from AT&T competitors A+E Networks, AMC Networks, Discovery and Viacom from its packages for new subscribers, so it’s hard to imagine it will keep them around for existing customers long-term. Viacom’s contract with AT&T is set to expire Friday; if nothing changes, customers could see 23 channels disappear overnight. Viacom issued a statement Tuesday saying, “AT&T is abusing its new market position by favoring its own content – which significantly underperforms Viacom’s – to stifle competition.” It’s not hard to imagine other media companies following suit. Speaking of stifling competition, let’s be clear: This is about AT&T’s $85.4-billion merger with Time Warner. The D.C. Court of Appeals issued its decision to allow the merger on Feb. 26, saying the government had failed to show how the “merger was likely to lead to any price increases for consumers.” Less than two weeks later, DIRECTV NOW raised its prices by 20% for existing customers. Here’s every channel DIRECTV NOW lost in its top cheapest package (while increasing its cost $10 per month), along with each channel’s corresponding rank in TiVo’s 2018 survey of the top 20 channels that consumers want the most in a live TV streaming package. Additionally, it no longer offers Weather Channel, NFL Network, Travel Channel, IFC, MLB Network, GSN, OWN, Fuse, FYI, Sportsman Channel, Fusion, or Tennis Channel in its more expensive tier. The only bright side is that it did add HBO to both of its packages, which came in as the No. 6 most wanted channel in TiVo’s survey. If HBO is a must for you, DIRECTV NOW might still be the best option — particularly if you’re an existing subscriber locked in at its current $5/month price — as it costs $15 to add it on to every other service or to get a standalone HBO Now subscription. That said, if you’re looking to switch, now is a good time. Sling recently debuted a promotion to lower its prices to $15 for its Orange and Blue packages separately and $25 for both of them together for your first three months of service. There have also been rumblings, as reported by CordCuttersNews.com, that if you threaten to cancel DIRECTV NOW, AT&T will offer $10 in credit for three months to keep you on. Ultimately, this is a big loss for consumers, but it also shows the promise of live TV streaming. When cable companies hike up your bill at random, your only recourse is to call them and plead for a fresh promotional price. By raising prices for a worse product, DIRECTV NOW is acting like an old-school cable company. But now you actually have the ability to switch providers. That said, DIRECTV NOW represented the most complete cable replacement for cord-cutters by far. We’re left with a number of imperfect options that all have some major gaps in their channel lineups. Here’s hoping Apple fills that void with their streaming service announcement next week.